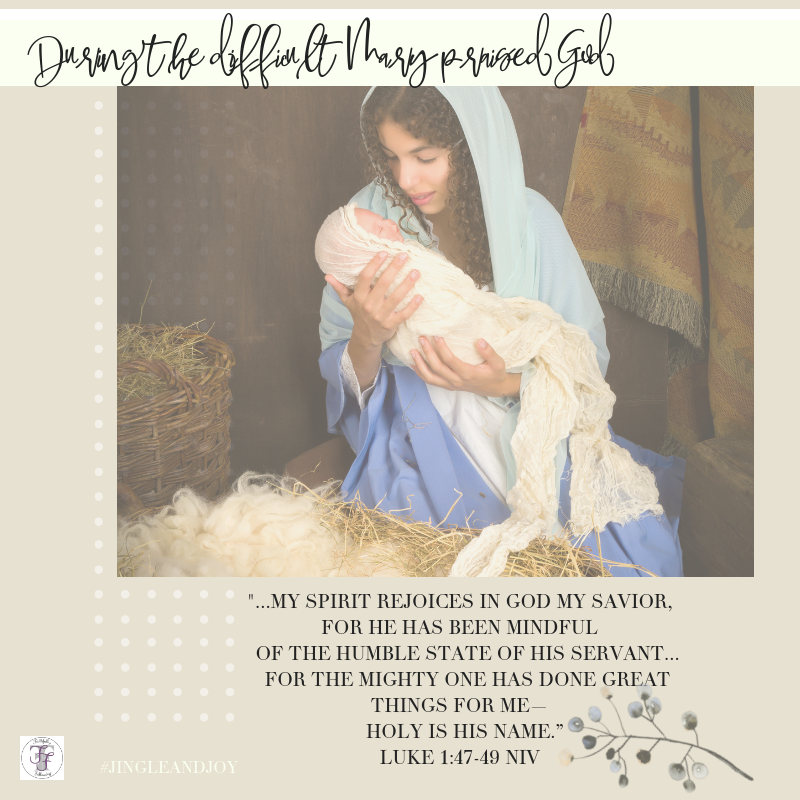 Every year the scriptures that tell of Jesus’ birth reveal something new to me if I let them. If I slow down and read them with fresh eyes, an open heart, and a prayerful disposition, God always unfolds a fresh message through His word. This year, with Christmas approaching, a newly released book in my hand, and a heart filled with grief, I still come expectantly. God’s word does not disappoint. It is active, alive, and relevant every single day. It meets us in the highs and lows and speaks. The question is, are we listening? Are we ready to hear? Are we ready to receive what is offered? Are we making room for the babe to dwell in our hearts and fill our lives with all he offers? Peace. Joy, Comfort. Strength. In my need book, Jingle and Joy, Praying Beneath the Tree, I unfold a lesson learned from the Shepards. One I believe we can learn from as we enter into this busy season where the world pulls us hard and leave little room for getting quiet to listen. • Pause. When the to-do list is the size of Santa’s list, pause and ask yourself what can be eliminated. Read Luke 2:1-20 with fresh eyes leaving room for the awareness of His presence. In the wait, soften the noise of the world, and look for The King. Listen for the joy. The sound of His voice in His word as you open the Bible. What did you see in your Bible today as you opened it? What was fresh? Today, I experienced the God of Comfort waiting for me. I found Mary praising God in the difficult. His fresh message for me? Jodie, I am with you in the difficult. I see you in the difficult. I am here to offer you comfort, reassurance, and the Mighty One is doing great things for you. What is your difficult today? Mine? I lost my son October 25th of this year to a horrific accident caused by an impaired driver. I now walk through grief with my husband, daughter, and our family as we approach Christmas without our son. Yours? Many I have heard from are experiencing loss and grief. Others are in need of jobs, struggle in marriage, have an illness that is eating away at them, and loved ones who don’t have the hope of Jesus. He is Immueal~ God with us. He is El Rio~ God sees us. He is there in the difficult and present in the wait. There is not one valley that we have to walk through alone. Today come with fresh eyes, a heart like Mary, to a God who is speaking. Come and make room for the babe. He wants to meet you in the difficult. Do you need some mending? Dear Jodie, My heart aches for your loss and I am truly in tears imagining your sorrow and also understanding on a level, but different, I know. We released our youngest child with special needs into the care of my sister-in-law and her family in July. I struggle with many mental health challenges and for a lot of reasons it became evident that she would receive the best possible care and opportunity with them. This all happened in a very messy way and like most families my husband’s family’s (and ours) dysfunction has become most evident. Communication limited and estranged. My daughter, who my husband adopted at birth and I became her mommy just before she turned 4 (she is now 8 1/2) is loved so well, but I am almost a ghost, if even that at times, as I am not fully acknowledged as being her mom for these past few years. It is greatly complicated but I grieve and mourn silently with shame and guilt keeping me from being able to share this huge shift and loss in our lives with many. I am desperate for my pain to be known in some way although it appears as a contradiction to the outsider. Anyhow, you see, I cannot fathom your loss and yet, I have lost a child in a way, too. May I follow your example of seeking comfort in Him and in Him alone. Your courage and strength to face the day spreads to others. May your heart be held in an evident way by our Father this Christmas. Amen. Thank you, Jodie! And thanks be to God that He knows all! Thank you so much, Cindy. You are a blessing.